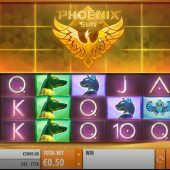 Phoenix Sun slot is a unique game which combines elements from Netent's Pyramid Quest and When Pigs Fly as you have the multiway set-up and wins may extend the ways to win by adding rows to some reels. The theme is naturally ancient with the Sun God and other mysterious symbols along with the usual card ones of A, K and Q. There are 243-ways to win and the Pharaoh is best-paying awarding 4x stake for 5 down to the 10 awarding .8x stake for 5-of-a-kind. The awards seen low but the symbols are all stacked except the Wilds of which there are 2 types: this is important as the yellow Wild simply makes wins with no multiplier and the Phoenix Wild does the same but is necessary to get the feature of 8 free games. So, each time a win drops in with a Phoenix Wild included, the Wild will smash some blocks off of the bottom of another 243-way slot which sits above the main game. The reels will then respin as part of the same game, but there will be more ways to win as one or more reels will now have 4 or more rows. On the left of the reels you will see a Phoenix Wild counter - should you get more of them during the respin they will expose some more symbols at the top further increasing ways to win in the next respin. 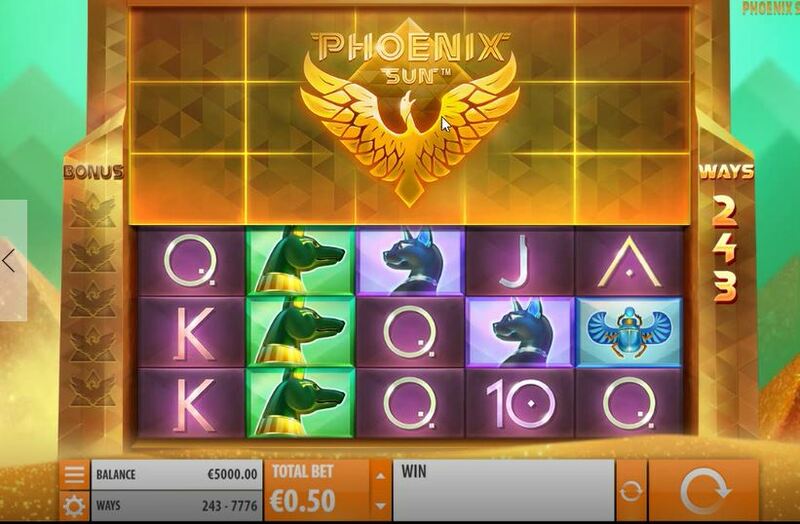 Once you have accumulated 5 Phoenix Wilds all blocks will have been smashed from the top reel set and this will then trigger 8 free games with 5 reels of 6 rows, thus your 243-way game has become a 7776-way slot! You cannot retrigger this as the Phoenix Wilds have now disappeared, but with the stacked symbols you can accumulate some pretty substantial hits.